ENSCONCED in a sultry recess on Stanley Street lies Chi Kinjo, the latest installment in Coterie Concept’s unfolding soap opera surrounding the powerful Lo family in Hong Kong. True to the tale, the establishment is a dual-concept space comprising a mezzanine restaurant and underground bar. If you’re here to dine, the first order of your night is to ascend the steps into the Phoenix’s earthen lair. Here, newly-engaged chef Lamley Chua slices and dices at a sushi counter to present decidedly Japanese fare, with borrowed and left-field twists to keep things interesting. Have, for starters, a salmon ceviche waiting to be spooned onto a spicy cracker, in turn tempered by the creaminess of avocado chunks and grounded by earthy hazelnut bits. Then dispense with your expectations of overly crispy and dried-out karaage cleaned out by the kaffir lime variant Chua serves; you only get tender and juicy bites in between the thin sheathe of batter. The barely perceptible nose of citrus staves off the typical oil-induced fatigue of lesser cuts. None will deny that the highlight of the night, however, is the aburi nigiri. These are served by the pair. If you happen to be close enough to the sushi counter, sidle up and watch a young master get to work. The first sign that you’re in for a good time is the size of the cut. Far longer than they are wide, Chua’s generous slivers promise what the average sushi restaurant does not: a respectable ratio of meat to rice, as tradition dictates. The meat, once pressed, should cover the sushi almost end to end. Glistening and warm morsels, finished with rich, luxurious toppings. Aburi Nigiri. The Japanese rice itself is done to perfection, offering up a whiff of vinegar while retaining enough stickiness to provide structure (and chewiness). The fish is hand-pressed into the blobs of pearl. It’s now the indulgent toppings come, in what is, by now, an expected departure from convention – think a lick of foie, dollop of buri cheese or even a truffled-up Hokkaido scallop. Adroit servers refresh your plates as your company explores the entirety of the menu, but by now the time to talk business (or kick back) has probably come. 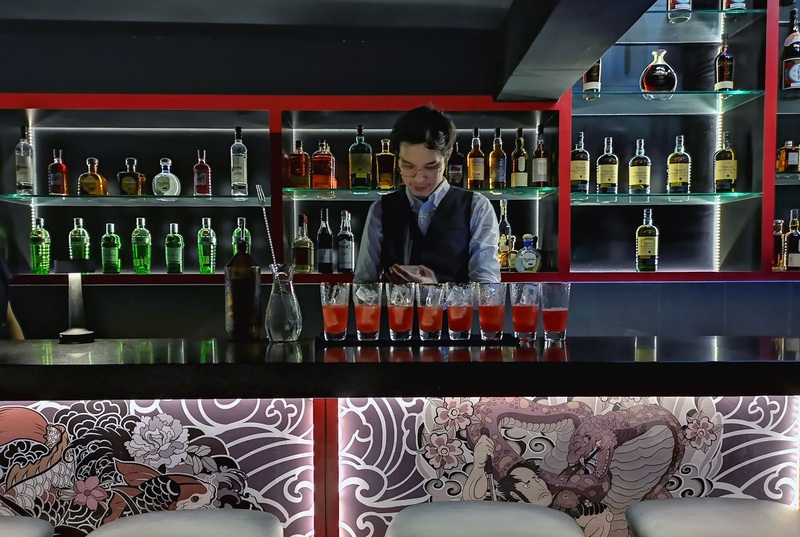 Sidle off your stools and make the short trip to the bowels of the building – Chi’s Highball Den. Bathed in the soft rays bouncing off the glossy black countertop is a familiar face. The storied Sam Wong, sharply dressed as always, is once again on hand to brew the poison of your picking. But if you aren’t feeling creative, he’s already drawn up a list. Wong masterfully whips up a line of Shiso Watermelon. The first libation you may have been proferred upstairs: the pale Shiso Watermelon, refreshing as it is ambrosial, and light enough to be consistently placed first in any flight of drinks in the Den. Another inescapable choice: the Gin and Ginger, cast in polished bronze cups that inspire envy at onlooking tables. The drink is exactly the sum of its parts, and not in a bad way: Tanqueray, mint and ginger beer with a splash of lime come together for a piquant and warming drink, with the aromatic headiness of ginger abetted by effervescence. The Gin and Ginger, complete with gilded straw. “A highball is basically any spirit with a mixer,” Wong reminds us. The menu, after all, lists only 10 carefully constructed staples unique to the Den. But make no mistake, the backlit bottles lining the Phoenix’s underground hideout are the real deal here. We spy Talisker and Lagavulin, and the rare Oban Little Bay. There’s just one rum, but the warm vanilla of a Ron Zacapa will scratch that itch just fine. Unlike Eliza Cocktail Bar, no band is on hand in the Highball Den to interrupt the dealings – or joyous conversations, sure – of Chi Kinjo’s guests. So pull up a chair and dig in.